The first of three regional conferences is almost here. You can register here. 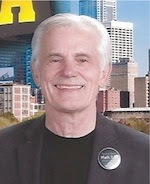 As far as technology is concerned NCTM has highlighted Technology as a Tool sessions in its preview as an essential topic. Here's the description. Discover ways in which tools and technology enhavce meaningful instructional experiences with presentations that highlight opportunities to support students' increased discourse, strategic thinking, and engagelment with importan mathematical ideas. The opening session sounds good for an overview of issues concerning teachers today. are talking together to make sense of important mathematics and each and every student is contributing to the conversation. 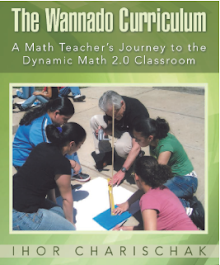 So, how do we ensure that all students develop as mathematical thinkers and communicators? Leverage the predictable nature and uniform design of instructional routines to support students and teachers alike. You will find a list of all the sessions here. 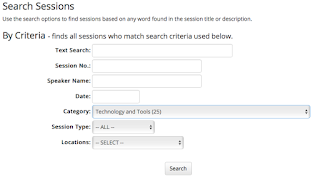 To see all 25 of the Technology and Tools sessions click on the Search Sessions image above. Then choose Technology and Tools from the Category field. 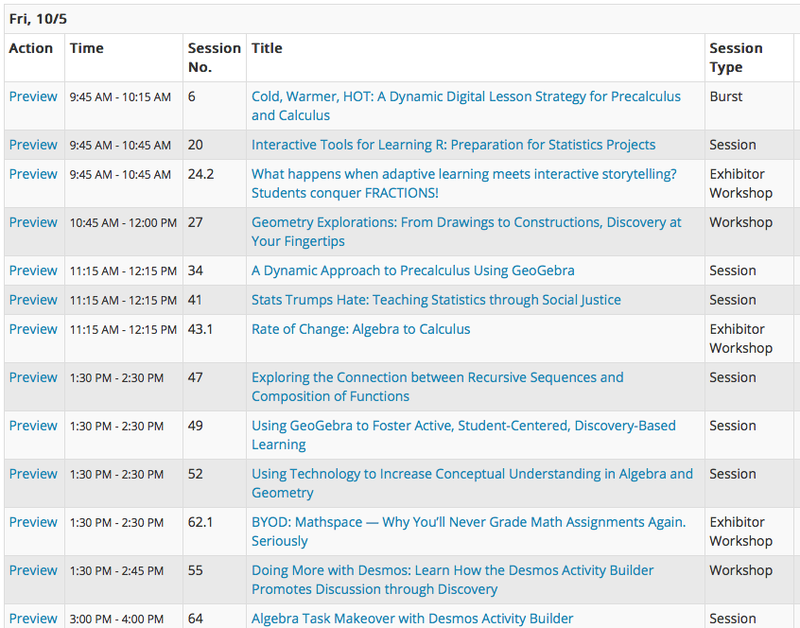 There are a total of 195 session so 25 Tech sessions are about 13% of the total. 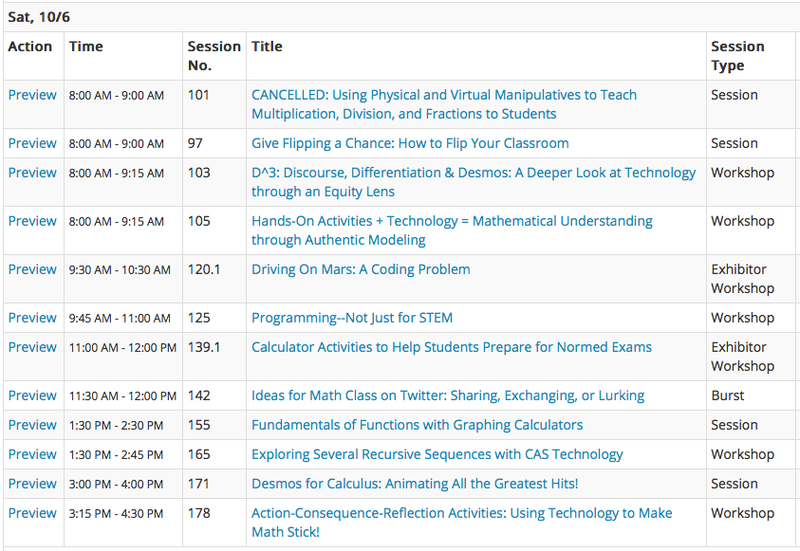 I was surprised to see that almost all the tech sessions were geared toward high school teaching. 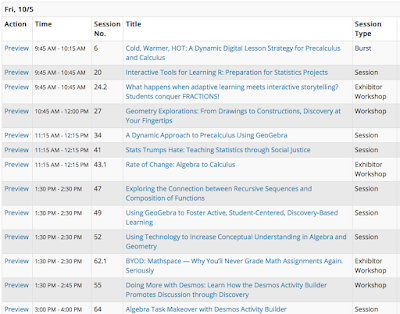 Desmos, Geogebra and graphing calculators were the application most used in the sessions. Since my personal interest is middle school, here's the ones I would attend (in no particular order). Experience the power of exploring geometry concepts hands-on, starting from simple drawings of geometric objects and going right into manipulating their attributes, testing conjectures, and developing geometric properties. Participants will participate in a hands-on workshop working with technology and geometric problem-solving activities. This workshop will explore how to integrate Desmos with your curriculum to deepen discourse, differentiation, and formative assessment. You'll experience several strategies for more robust mathematical engagement with Desmos including using word banks, sentence frames, and supporting students to do error analysis on common misconceptions. 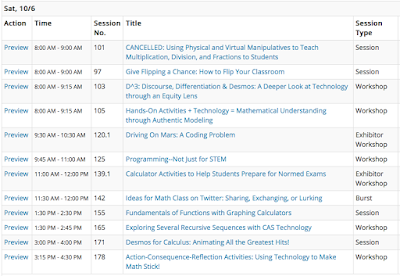 Twitter is a great place for math educators to find tasks, routines, and camaraderie. 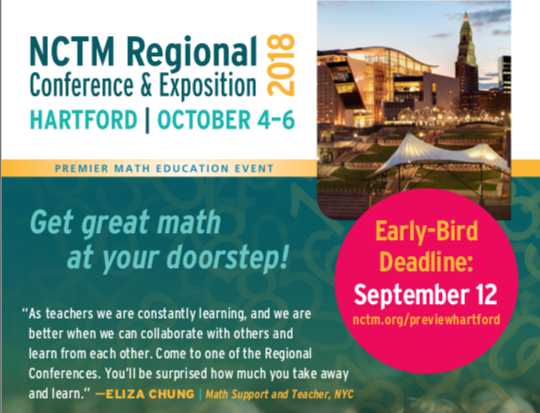 In this workshop, we will visit the #mtbos (Math Twitter BlogOSphere), #elemmathchat, #observeme, #iteachmath, and other Twitter hashtags and people for inspiration and motivation for both teachers and students! If you attend any of the above sessions (or any others for that matter) please let me know how it went.